It is the first day of summer and many grandparents will be seeing more of their grandchildren in summer. Maybe it will be an out of state weeklong visit. Some grandparents host grandparent camp for all their grandchildren to get together. Others do more out of school babysitting while parents are working. Whatever the reason, you should have a plan. I am going to write several posts on this subject and this is the first one. How about spending some time with the kids doing thing you did or their parents did as kids. This post is about things to do at home. Here are a few ideas and please share your own in the comments. 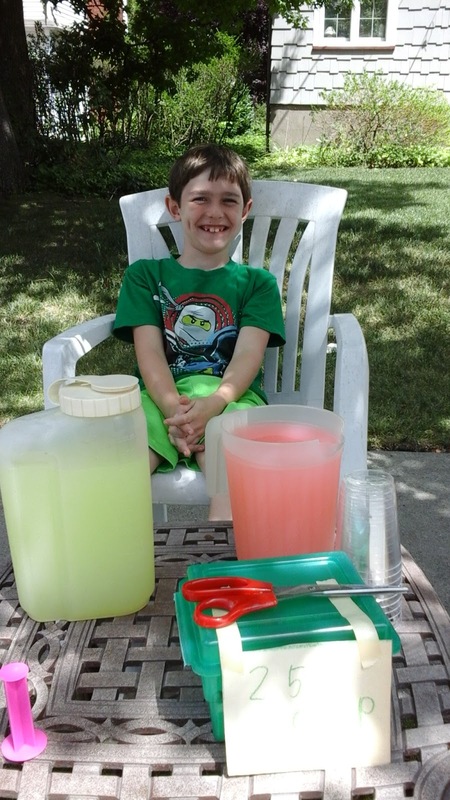 My kids loved having a lemonade stand set at the end of our driveway. Today arranging for the proceeds to go to charity is a popular way to also develop understanding of charitable giving. Nothing beats a sprinkler party on a hot summer day. Besides cooling off, all that running around means getting exercise and using up energy. Always a favorite. Fill up a container for each team to throw water balloons at each other. This is great fun for older kids. 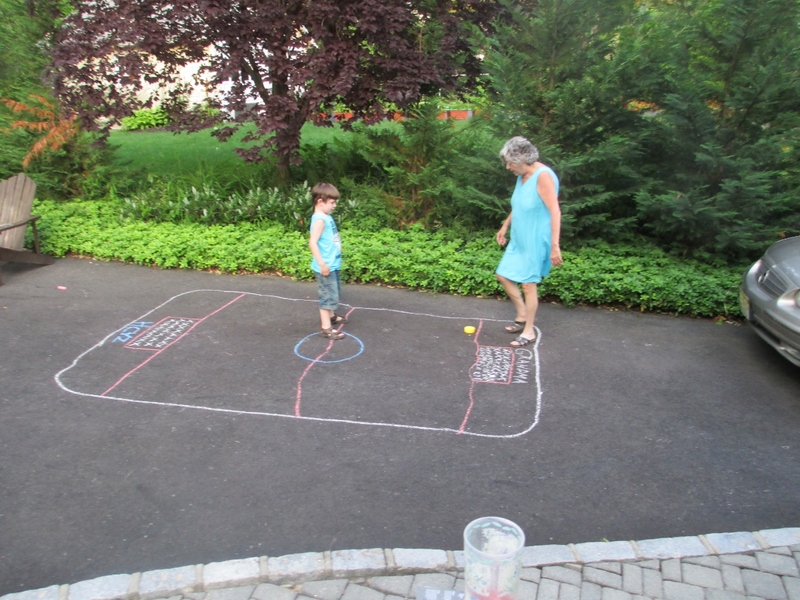 Turn your driveway into a game using a piece of chalk and something to use as a "landie." The Crayola Chalk Grab and Go games at Amazon are easy inexpensive aids to set up your own games. That is what I used in this picture. My grandson also liked the obstacle course set - good for about age 5. When we were kids the neighborhood shoemaker kept us in supply of old shoe heel soles he had discarded. Gather up stuff you have already.... markers, felt, cloth, ribbons, buttons, whatever and set up an outdoor arts and craft table. Consider following up with an Art Show with the items on display. When I was a kid and all the kids in the neighborhood participated in an end of summer talent show. The parents and other neighbors came and we served lemonade and cookies. 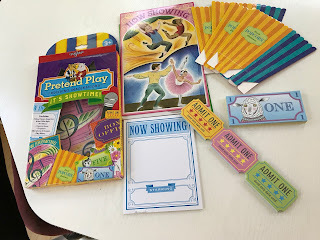 This cute Pretend and Play set can add a professional tone to such an event. This is a great idea if you are hosting grandparent camp for a week and is something they can work on each day and present to parents at the end. What a great time to develop skills and talents. 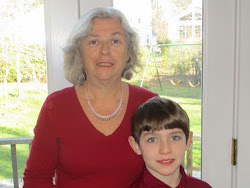 Can you teach a grandchild to bake, sew, knit or build a birdhouse? Just a few ideas for starters. How about playing marbles, ball and jacks, hula hoops, etc. When I was a kid, if someone in the neighborhood had an appliance being delivered in a cardboard box we would gather round to claim the box and it would provide hours of fun. Today you can order an cardboard house or pirate ship for the kids to decorate. I got this one to review and it was in our garage in the winter but provided outdoor play for years...yes years for our grandson. He didn't want to part with it but it finally said "Enough already - let me go! And it was completely recyclable. I highly recommend these. I have seasonal books that I pull out year after year even when a child is "too old for them." Kids love this annual ritual and remember the book from year to year and want to see it again. I am such a traditionalist by heart and I especially enjoy this with books. This article could go on forever but I hope it might inspire you about what you might do. 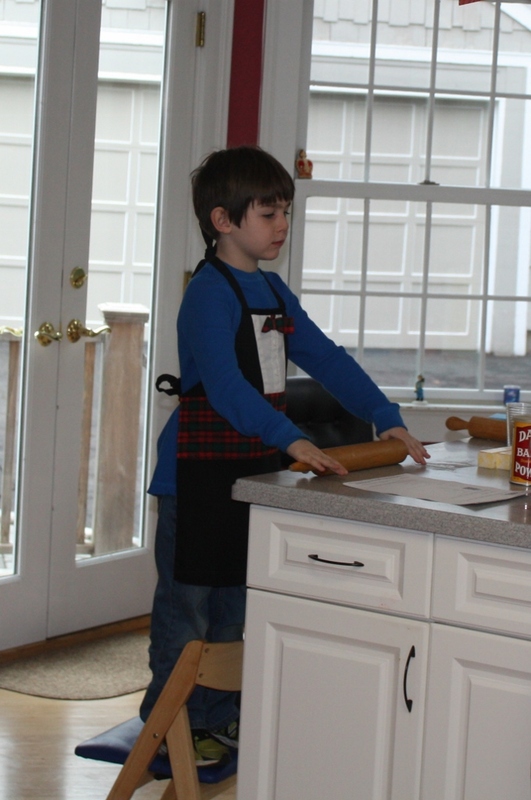 These ideas may seem fresh and new to the grandkids rather than dusted off from the past. Please share your ideas and things you do with your grandkids in the comments.